SINCE THE LATE 1970s, two men have emerged as the most powerful and most dangerous drug lords in the world. Pablo Escobar, a farmer’s son from rural Colombia, and Joaquín “El Chapo” Guzmán, a product of Mexico’s rugged Sierra Madre Mountains, have delivered immeasurable amounts of cocaine and other drugs to the world during their respective reigns. In doing so, they’ve amassed obscene amounts of wealth — and exposed the world to unimaginable levels of terror. 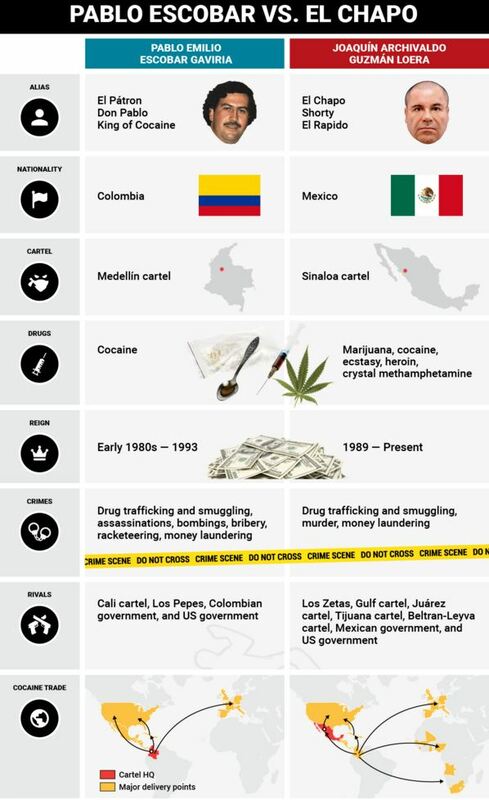 While a direct comparison of Escobar’s Medellin cartel and Guzmán’s Sinaloa Federation is difficult — they’ve dealt with different products, different competition, and different markets — looking at the two groups’ leaders side by side gives some idea of their power and influence. Born to a humble farming family near the city of Medellín in north-central Colombia, Pablo Escobar started his career committing various petty crimes. He graduated to smuggling thereafter and soon began carting shipments of marijuana. 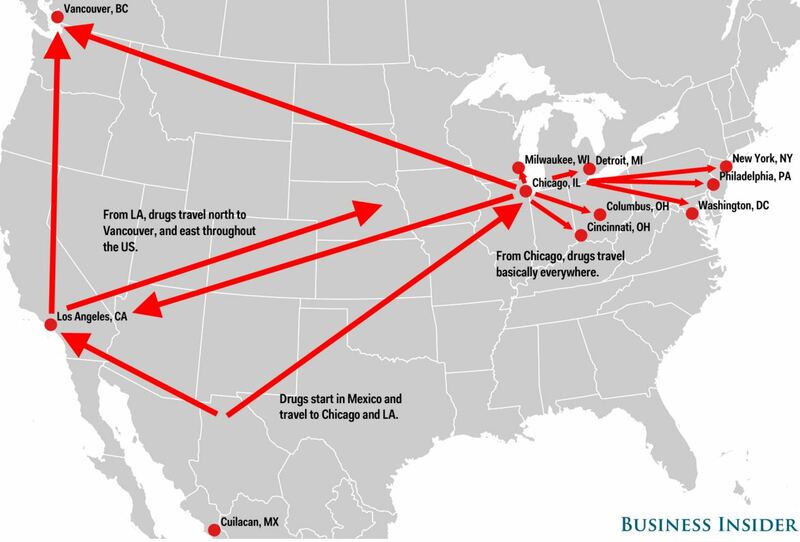 By the late 1970s, he and several associates had begun trafficking cocaine out of Colombia (which remains one of the main cocaine producers in the world) and, by the early 1980s, their Medellín cartel was shipping hundreds of millions of dollars’ worth of cocaine north to the voracious US market. While Esocbar’s income and wealth are hard to measure, it’s believed that he was raking in $420 million a week by the mid-1980s, which would amount to roughly $22 billion a year. By the end of that decade, he was supplying 80% of the world’s cocaine — and smuggling 15 tons of it into the US every day. He spent lavishly on himself and his family and was also a patron of local causes — building apartments, soccer fields, and handing out cash to the poor. These acts of charity won him popular support and bolstered his image as a man of the people. “Pablo was earning so much that each year we would write off 10% of the money because the rats would eat it in storage or it would be damaged by water or lost,” Escobar’s brother, Roberto, wrote in a 2009 book. Escobar’s illicit empire attracted the attention of the Colombian government, which attempted to shut his operations down. Clashes between the government and drug traffickers unleashed a years-long wave of violence on Colombia. The Colombian government, with US assistance, deployed a special force to bring him down (though that force was badly bloodied in their first encounter with the cartel). By mid-1991, the government’s campaign forced Escobar to concede, and he negotiated an agreement that allowed him to lock himself up in a jail of his own design in the highlands near Medellin. By mid-1992, evidence that Escobar was conducting cartel activity from his prison compelled the government to try to apprehend him; instead, Escobar fled the prison and went on the run. During this time, he and his family traveled from hideout to hideout, never staying in the same place for more than two days. At one point, Escobar torched $2 million in cash to help his family stave off cold weather. He eventually separated from his family, hiding out on his own. On December 2, 1993, his luck ran out. Colombian security forces — believed to be working with Los Pepes, a vigilante group that was also tracking Escobar — converged on the Medellin home where he was staying. When they burst through the door, Escobar scrambled out onto the rooftop. Like many of the details of his life, it remains unclear who fired the shot that killed the most powerful — and most dangerous — drug lord in the world. While Joaquín “El Chapo” Guzmán is not the first drug baron to emerge from the Sierra Madre Mountains of the Sinaloa state in northwestern Mexico, the state’s namesake cartel rose to global standing under his watch. As the head of the Sinaloa cartel, Guzmán oversees marijuana and poppy cultivation that covers more than 23,000 miles within Mexico, an area larger than Costa Rica, as well as a network that has operatives in 17 of Mexico’s 32 states and reportedly operates in nearly 50 countries, including an extensive network in the US. 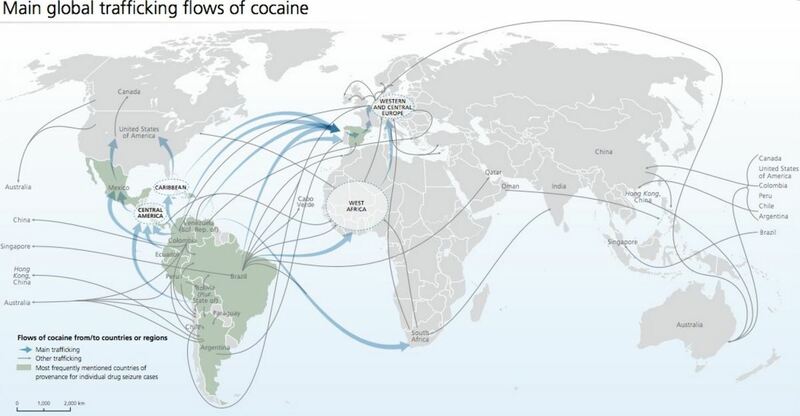 The cartel is believed to control 35% of the cocaine produced in Colombia (the world’s largest producer of the drug) and, according to the DEA, in 2013 it supplied “80% of the heroin, cocaine, marijuana and methamphetamine” flowing to the Chicago region of the US each year. The Sinaloa cartel is also believed to have an immense international footprint. Cartel activity has been reported in Australia, Hong Kong, and the Philippines in recent years. And, according to the UN Office on Drugs and Crime, Latin American organizations like Sinaloa are looking to expand their operations into new markets, using trafficking routes through Africa and Asia. “El Chapo” is no stranger to law enforcement, either. In 1993, not long after he ascended to Sinaloa’s upper ranks, Guzmán was arrested in Guatemala — where he had fled after a cartel shootout in Guadalajara killed a Catholic Cardinal — and locked up in a Mexican prison. There he stayed until 2001, when he escaped, reportedly by hiding in a laundry cart. He was on the run for 13 years before he was caught in Mazatlan, on the Sinaloa coast, in February 2014. 17 months later (a period of incarceration that didn’t interrupt his managerial duties), he escaped again in spectacular fashion. He remains on the loose now, three months later, but Mexican security forces may be getting uncomfortably close. Email “Here's how the two most infamous drug barons in history compare with each other”. Feedback on “Here's how the two most infamous drug barons in history compare with each other”.